"The holidays deserve a pie worthy of its occasion. This towering pie is piled high with apples that bathe in a deep maple caramel with a slight tang from cider vinegar. 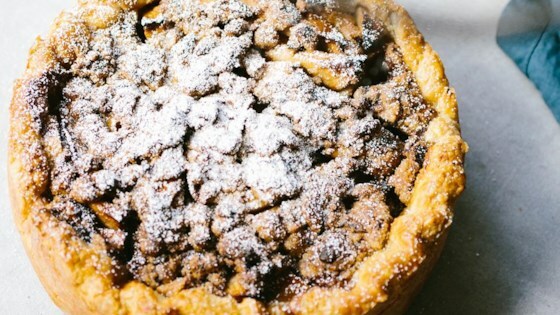 It's topped with a buttery crumble studded with crispy candied bacon. A pie that definitely earns its place at the table." Soooo good! Added a butterscotch-bourbon sauce and served with a scoop of ice cream. The bacon crumble is a nice twist. Tasted fine but not pretty.